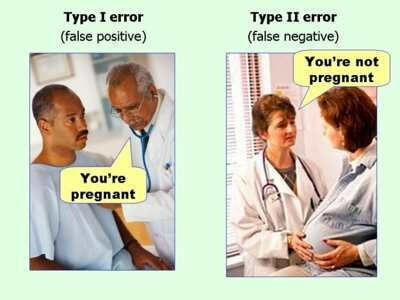 For the people who are statistically challenged this is humorous way to describe the differences between Type I(false positive) and Type II(false negative) errors. I saw this infographic originally on the Marginal Revolution blog. They think the original post was probably over at FlowingData website who gives credit to Jim Thornton’s twitter account. As a person who is seriously considering going without health insurance if the insurance rates go up too much, the question you have to ask yourself is whether you can do a better job minimizing the financial impact of false positive and false negative diagnosis errors than your insurance company. As an example there are a lot of false positives associated with prostate and breast cancer. This entry was posted in Healthcare, Humor and tagged healthcare, humor. Bookmark the permalink. ← I Thought Hillary Clinton And The State Department Were Brain Damaged When They Sent Ambassador Stevens to Benghazi!